Detex means security hardware for your exits, and is the leader in innovative security door hardware, such as integrated alarm systems, guard panic bars, exit devices and door alarm security. 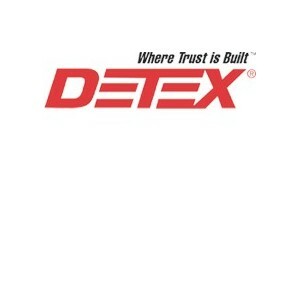 For more than a century, Detex, a USA company, has earned the trust of millions of property owners to secure and protect their people and property. To find what you are looking for, review the products below or download the Detex mini catalogue using the link below. Browse the Detex Mini Catalogue of Security Door Hardware. Browse the Detex Mini Catalogue of Security Door Hardware in French. WDEx10EEX Weatherized Delayed Egress Without Electromagnetic Lock The WDE EasyKits provide a secure outdoor system with 15-second delay and 100dB alarm when someone attempts to exit. Exit device has 100 decibel alarm. 9-volt battery operated, supplied with cylinder dogging. Weatherized, mortise cylinder sold separately. Vertical rod assembly for the ECL230D. 9 volt battery operated. 100 decibel alarm. Supplied w/cylinder dogging. Mortise cylinder sold seperatly.